This entry was posted in Photographs and tagged Dry Creek, roadrunner, roadrunner nest. Bookmark the permalink. I’m 57 years old and for most of my life the only knowledge of this bird came from Bugs Bunny. These little guys look so vulnerable hidden among the cactus prickles. Such an interesting juxtaposition. I’m a little older and have been around Roadrunners all my life, even remarked that I’d never seen any babies, until this year. 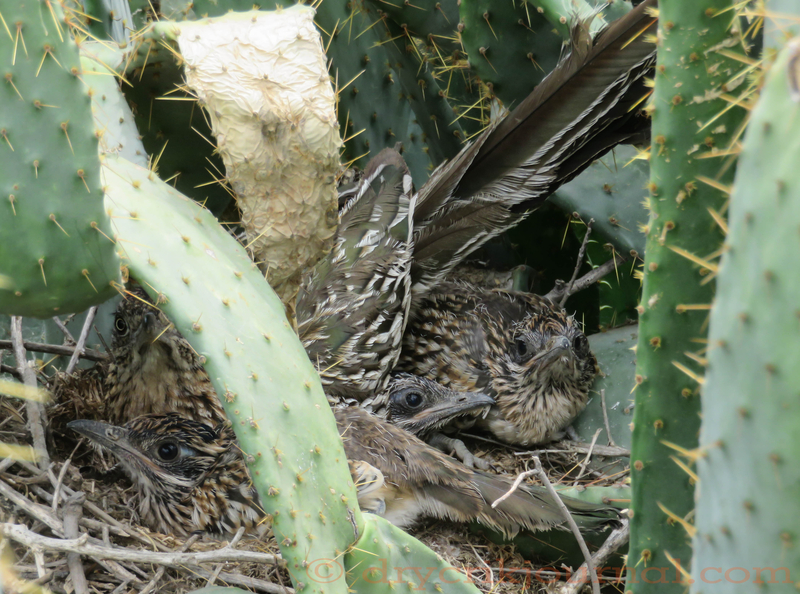 The adults pick pretty safe and hidden places for their nests, using this cactus patch last year. It just so happened that cactus sagged a little to expose their nest or we’d never seen them at all. The adults have been pretty good about our constant visits, standing aside watching us watch. I too only knew the road runner from comics. And then one day visiting Arizona (from New Zealand) I saw one! Because of the comic I recognized it immediately, and never knew before they existed in the real. Beep! Beep! Agreed. Just there for company. I notice the adults are leaving them alone more often now. And Richard, that may be an adult with just one eye and beak showing upper left. Hard to tell, the eye or light is a little different. This is so cool! I’ve lived in NM all my life and there are a lot of Roadrunners…but I don’t remember ever seeing little ones. They hide well! I expect that when we see them out and about, they will nearly be full grown. I remember seeing several last year about 75% grown and remarking that they must be juveniles. We’ll see if the adults take them hunting or bait them out of the nest, but right now, even as crowded as it is, they seem quite comfortable. These guys are so adorable ! Wonderful capture.